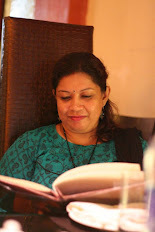 Lassi or buttermilk drink is a popular and traditional Indian drink, originated in the state of Punjab. It is made of Yoghurt with water, salt, sugar, pepper and flavoured with spices. 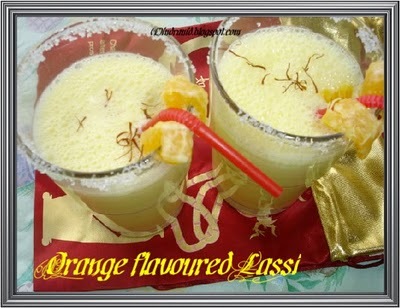 Different flavours of lassi are also made using different seasonal fruits. Lassi can be salty or sweet. Lassi is enjoyed chilled with ice cubes during hot summers and it's a real thirst quencher. So, if you havn't tasted them, chill with this great tasting refreshment in this summer and at the same time, gain the benefits of Yoghurt which it is made of. Yoghurt is a dairy product which is rich in Potassium, calcium, protein and B vitamins(B12). It is a great source of Calcium for lactose intolerant people, as there is very little lactose present in it and instead it contains the digestive enzyme, lactas. The most outstanding benefit of yogurt comes right from the unique way yogurt is made. Yoghurt is simply milk or cream that is cultured with active live cultures. These cultures are the key to many of yoghurt’s health benefits. Active live cultures are basically good bacteria that are necessary for the body to function at its best. These good bacteria prevent the growth of harmful bacteria that cause bacterial infections and diseases. Healthy levels of good bacteria also promote digestive health and boost the immune system. Good bacteria prevent imbalances in the body’s yeast levels, which can prevent various types of yeast infections. It has been shown that good bacteria can also prevent urinary tract infections. If you are taking antibiotics, they may be destroying the good bacteria present in your body. Eating yoghurt regularly can help restore your good bacteria levels. Active live cultures actually reduce yoghurt’s level of lactose, making yoghurt a delicious dairy alternative for anyone who is lactose intolerant. Yoghurt Strengthens and stabilizes the immune system. Calcium rich yoghurt signifivantly increases body fat loss, boost the body's ability to build bone, helps prevent and heal Arthritis. 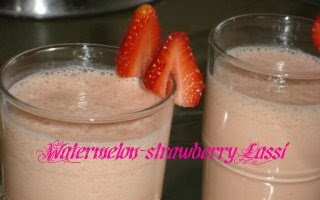 Almost every summer afternoon after lunch, I prepared some varieties of lassi and enjoy the goodness yogurt. Lemon Zest : 1/2 tsp. Roaster cumin powder : 2 tsp. In a blender, put yoghurt, water, lemon zest & juice and salt and blend until it forms some foam for about 3 minutes. Add sugar according to your taste and blend again. 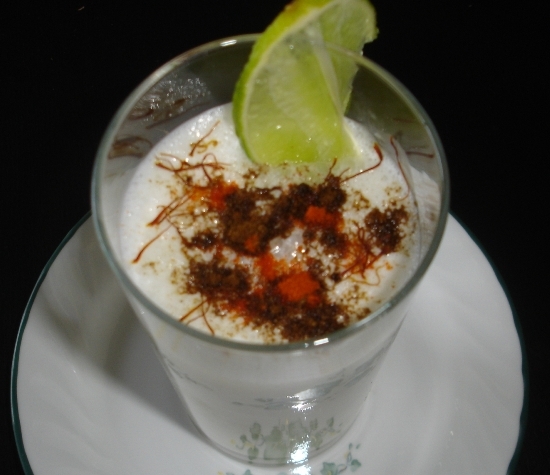 Lassi in ready to serve. Pour in a glass, drop few ice cubes, sprinkle a pinch of roasted cumin powder, chilli powder and 3-4 saffron stands. Relax in an outdoor setting and enjoy the refreshing cool drink. Cut strawberries and watermelon in pieces. Put all the ingredients in the blender and blend until frothy. In a blender, take all the ingredients and blend until frothy. To serve, pour over crushed ice and sprinkle some saffron strands over it to decorate. Beautiful drinks, never get bored of them..
What a healthy and traditional post it is... Its much inviting me to taste it right now... Slurrp ! Keep Rocking ! Nice food combination, thanks for sharing your ingredient that helps people keep their health up naturally. I used to drink Yakult a yogurt milk, I find these products not only delicious but also perfect for digestive system & as far as I know it contain a special strain of the bacterium Lactobacillus casei Shirota that contains billions of live and active "good bacteria.